Sissy Mena is a recently-formed Chicago trio specializing in driving, melodic, shoegazey rock, which they're introducing to the world via their debut six-song EP, Young Girl. The band will celebrate the release of the EP this Wednesday, December 16 with a show at Double Door (FREE, 8 p.m., also featuring Future Ghosts, California Wives and Satellite 66). Young Girl is a solid introduction from a unit that should have no problem winning over anyone who likes a healthy dose of fuzzy guitars and distortion with their rock. 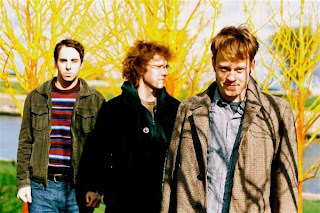 While it's apparent on songs such as "Udellia," "Pay for Some Sins" and the EP's title track that the three - Tyler Brinegar, Adam Bonich and Taylor Briggs - have a fondness for pure shoegaze, they can't be pigeonholed in that genre, sometimes seeming just as happy taking a more straightforward (but still deliciously noisy) approach (see "History," "Certain Smiles," "Main Drain"). This variation works in the music's favor, preventing the set of songs from ever sounding too abstract or monotonous and allowing the trio's skills to shine. Listen to the EP and download a copy here, and head to Double Door Wednesday night for what promises to be an excellent show. In addition to this week's EP release party, the band also have a gig coming up on Friday, January 15 at the Hideout (10 p.m., $8, more info and tickets).